Junior Girl -- Abby McCarthy (Girls’ Prep Hockey) has been thrown into many different scenarios this year and she always rises to the challenge. Our first-year forward has made a huge impact and has stepped up in a time of need as the girls are struggling with injuries. Last weekend against some of our tougher competition, Abby managed to take on a new position and double shift four games in a row. In our final game of the weekend, Abby scored two really important goals to secure the win for KES! Endurance, toughness, and a relentless “never give up” attitude has made Abby one of our rising stars this year. Congrats, Abby! Senior Girl -- Chloe McClean (Girls’ Prep Hockey) is a first-year defense, but you wouldn’t guess it by the way she plays! This poised, smooth-skating player has really made an impact defensively on the team. One of the hardest shooters from the point, Chloe has created many opportunities in front of the net. She’s also very sneaky, creeping in behind the other team to score goals back door. She is equally talented offensively as she is defensively which is why Chloe played a big part in a 2-2 tie this weekend against Rice, netting her only goal of the weekend to get our team going. We cannot wait to see what more she has in her bag of tricks. Senior Boy -- James MacGregor (Boys’ Prep Hockey) played like a true leader at Maine University against Ulysse Academy. James led the way to the boy’s victory in their first game by scoring two goals. James’s work ethic every shift sets the standard for all his teammates, and he consistently encouraged his teammates throughout the weekend’s games. Congratulations, James! Junior Boy -- Justin Day (Junior Boys’ Basketball) showed his athletic diversity at the ACIS basketball tournament by leading our team to a semi-final win. He took his rugby player mentality and drove to the hoop and muscled his way to many rebounds in a key win over Halifax Grammar School. His attitude and toughness led the team to a one-point win. Junior Girl -- Bella Turner-Galaise (Wrestling) - Bella pinned four opponents in less than five minutes total wrestling time last weekend to win GOLD in our 23rd Annual KES Wrestling Invitational. She displayed impressive technical skill while representing our School with respect and grace. It was great to see some of her Prep Girls’ Hockey teammates cheering her on and volunteering at the event. Senior Girl -- Once again, Téa Racozzi (Wrestling) displayed superb technical skills to pin all four of her opponents in the senior category this past weekend to win another GOLD medal. She was not afraid to combine tried and true techniques with some newer moves. Téa led our team, as captain, and she represented our School in a dignified and respectful manner all day. Well done, Téa! Senior Boy -- Evan Logan (Wrestling) combined fitness, athleticism and aggression in order to overcome a relative lack of technical skill in his first wrestling tournament, and he placed a respectable third this past weekend. His technical skills are rapidly improving, and we’re looking forward to seeing Evan contribute even more to the team in the coming weeks. Congratulations, Evan! Myth - Boarding schools are somber and lonely. 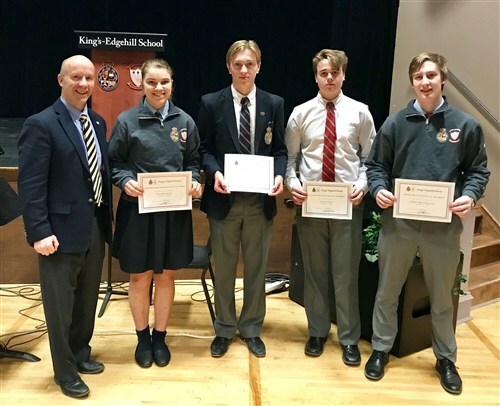 The King's-Edgehill motto is “Be More." We promise to challenge your child to reach their highest level of achievement and excellence in all areas of life and personal conduct - all while having fun and making lasting friendships. 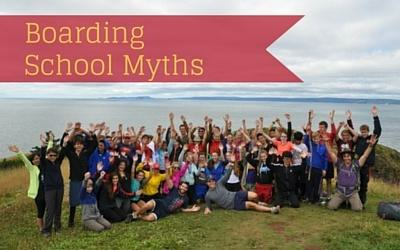 Download our Myth Busting eBook to decode more boarding school myths.